Long gone are the lazy days of summer, as well as the random spikes in temperature. With highs remaining steady in the 60-degree range, we can officially say that fall is here to stay. While some may pine for suntans and flip-flops, others embrace the the cooler air, which means pumpkin-flavored treats from Dunkin’ Donuts and Starbucks, apple picking fun (including apple cider and cider donuts) and of course, the fall foliage that for some reason, seems to look better in New England than in New York City. Fall foliage along route 116 breaks up the bright greens of Amherst, Mass. The New York Times reports that around a dozen tourist trains in the Northeast have created more initiatives that showcase the seasonal views. While these trains allow visitors to sit back, relax and enjoy as the autumnal scene unfolds in front of them, there are still those who would rather make the drive north and stick to their own schedule. 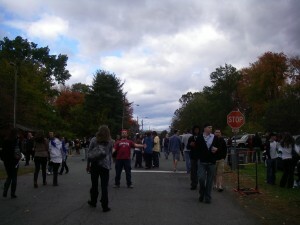 Current students and alumni of UMass Amherst walk towards the field to make it to the football game on time. Another reason why people decide to drive? Homecoming weekend! UMass Amherst (which I am an alumna of) just celebrated their homecoming weekend, along with University of New Hampshire and Wheaton College in Norfolk, Mass. This longtime tradition of collegiate alumni returning to their former stomping grounds includes weekend-long events, tailgating, and the all-American pastime of football. Hamburgers and hot dogs paired with beer against a backdrop of red, orange and yellow make for desktop-worthy photos. 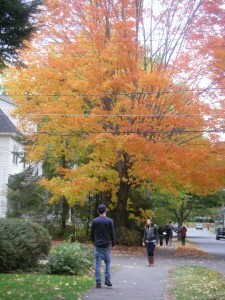 Some leaf peepers enjoying the view on Fearing Street. While the influx of out-of-staters to Massachusetts, Vermont and New Hampshire may be good for local businesses, not everyone is thrilled about these guests, many of which are from the tri-state area. Rumor has it that New Englanders, especially those from Massachusetts, frown upon these visitors — especially New Yorkers. In fact, “leaf peeper” or “leafer” is New England slang for tourists who drive slow through the area looking at the foliage. The term garnered attention after “Lethal Weapons“, a Family Guy episode, aired in 2001, where leafers with exaggerated New York accents infiltrated town. Lucky for New Englanders, the leaves are falling off soon. 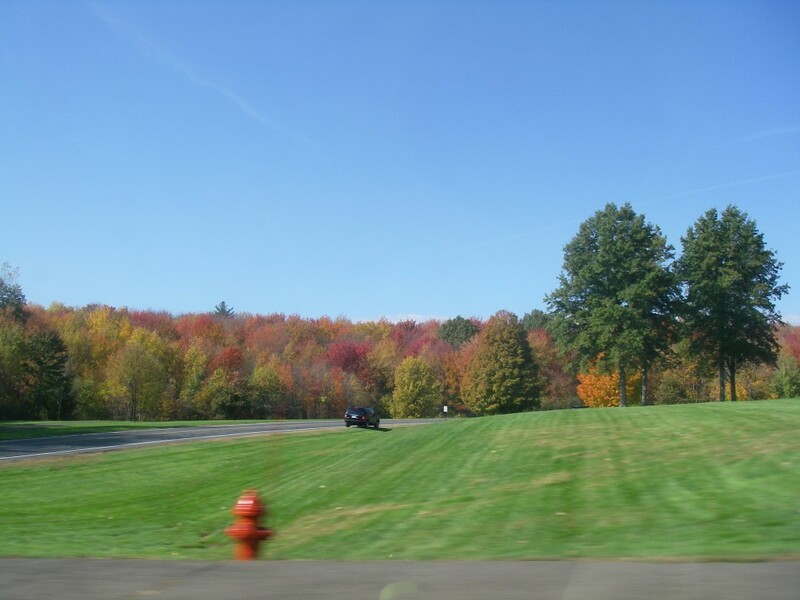 This entry was posted in Uncategorized and tagged Fall, fall foliage, Family Guy, homecoming weekend, leaf peepers, leafers, Northeast, University of Massachusetts Amherst. Bookmark the permalink.